At only 27 Linda already owns an impressive list of achievements that would normally take any artist many years to accomplish: trumpet player, singer, Big Band Director, and composer. Renowned musician and Jazz at Lincoln Center Musical Director, Wynton Marsalis expresses his awe on Linda when he says: “ She possesses an excellent awareness of time, rhythm, and a great sound, but above all, she has a deep understanding of musical concepts and ideas. There is a weight in her sound, weight, weight. This you either have it or you don’t and it is very unusual for such a young person to have it the way she does”. Notwithstanding, Linda’s talent goes beyond her professional career as a musician and projects her to a social leadership role. In 2012 the World Economic Forum embraces Linda as a Young Global Shaper in recognition of her efforts as a musician and entrepreneur in developing empowerment strategies for young artists, especially musicians, to assert their rights as creative individuals and also as a collective in Latin America. At 10 years of age, Linda participated in her first musical studio production by the now extinct label “Latin World” entitled “Tocando Tierra”. In it, she shared the studio with the likes of Alex Acuña, Paquito D’Rivera, Armando Manzanero, Bela Fleck, Don Grusin, Abraham Laboriel, Ary Barroso, Pedro Eustache and Roger Nichols among others, she being the youngest artist in the recording. In 2010 and 2011 she was invited several times to participate as a soloist of The Miami Symphony Orchestra and Simón Bolívar Orchestra, Arturo Sandoval, and Paquito de Rivera. In 2012, she made a special guest appearance with the Jazz at Lincoln Center Orchestra under the direction of Wynton Marsalis, thus becoming the first Venezuela woman to perform with this famous orchestra. In 2013 She performs for THE GRAN PRIX FORMULA 1 for the Kingdom oh Bahrain as a Soloist. She was invited to perform with amazing artists as Arturo Sandoval, Paquito de Rivera, Dizzy Gillespie Big Band alumni. Recently release her first record who has been nominated in different academies as Best New Artist. 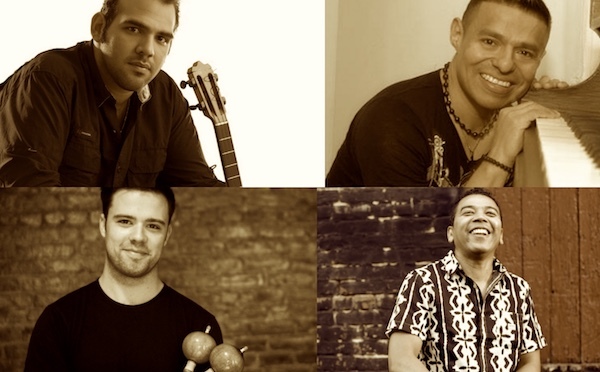 Venezuelan Jam Session at Terraza 7 on Friday, December 2nd, 2016 at 9:30pm.